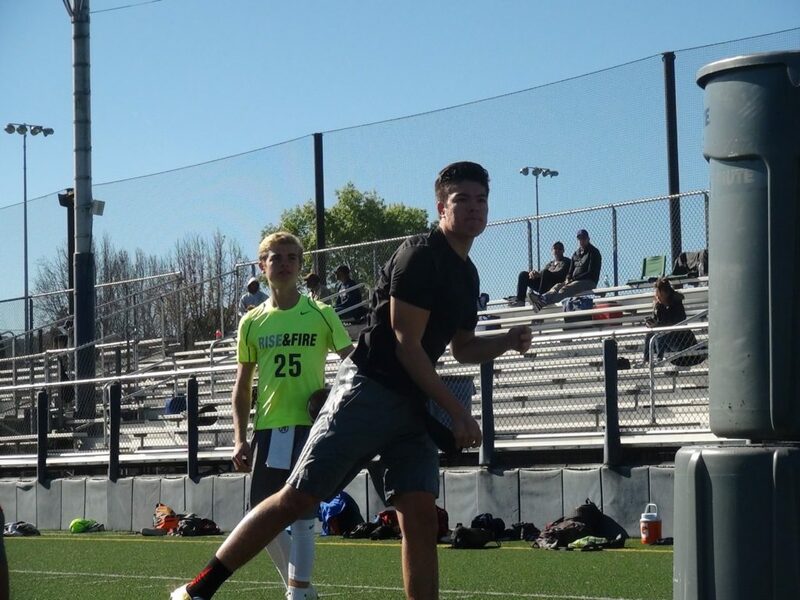 Long Beach Poly QB Matt Corral working-out at March's The Opening LA Regional. 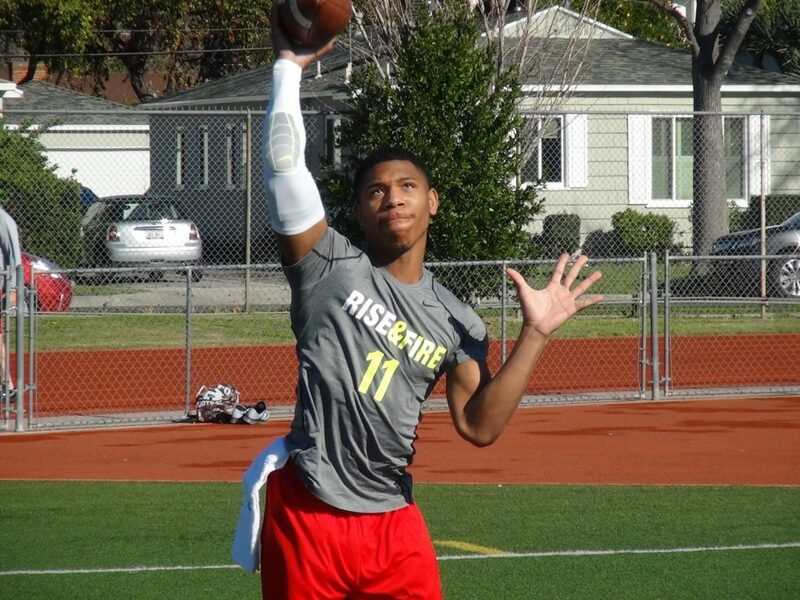 Look for 2017 to be a great year for quarterbacks in Southern California. Currently, according to the 247Sports.com composite rankings, two of the Top 10 QB recruits in the nation in the Class of 2018 hail from the CIF Southern Section. Topping the list is Long Beach Poly’s Matt Corral, who recently rescinded his verbal to USC. Corral, who transferred to Poly after playing his first three years at Oaks Christian, is considered the area’s No. 1 quarterback and he’s ranked the No. 3 overall quarterback prospect in America. With his recruiting now re-opened, Corral has offers from Alabama, Arizona State, Florida Georgia, Michigan, Texas A&M, UCLA and USC. During his career at Oaks Christian, Corral completed 401-of-625 passes (64.2%) with 74 touchdowns and 15 interceptions, according to MaxPreps. Editor’s note: for our purposes, we consider Southern California to be the CIF-Southern Section and LA City Section. 247Sports’ composite rankings has Corona Centennial’s Tanner McKee ranked No. 2 in Southern California and No. 5 in the nation. McKee, who led the Huskies to the CIF-Southern Section Division 1 semifinals and a No. 10 ranking in the High School Football America National Top 50 in 2016, is coming-off an outstanding season with over 4,000 yards in total offense. McKee, who is uncommitted with 22 offers, completed over 72 percent of his passes for 3,522 yards with 36 TDs and only eight picks. He also rushed for over 500 yards and 15 touchdowns. Newbury Park’s Cameron Rising is considered the 18th best college quarterback prospect in the nation. Earlier this month, Rising, who missed the second half of last season with a shoulder injury, switched his verbal commitment from Oklahoma to Texas in an off-field win in the Red River Rivalry for the Longhorns. Rising had an outstanding sophomore season, throwing for over 3,200 yards with 40 touchdowns. Before his injury last year, Rising completed 88-of-143 passes (61.5%) for 1,349 yards with 14 touchdowns and four interceptions. In five games, he finished as the team’s second leading rusher with 390 yards and four touchdowns. Newbury Park’s Cameron Rising at the LA Regional of The Opening in March. 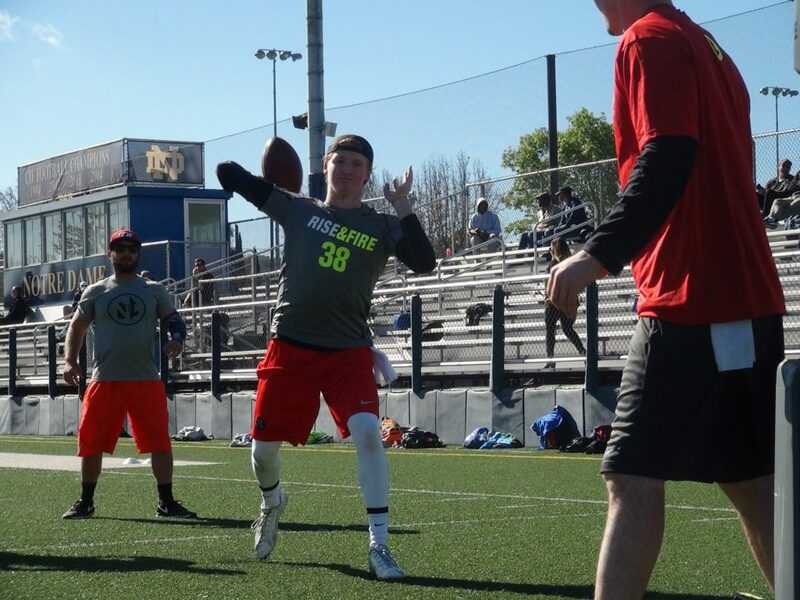 Paraclete QB Brevin White is listed as the fourth best quarterback prospect the CIF-Southern and LA City Sections. White, who will be playing for his third team in the last three years, played for Chaminade last year after playing his first two seasons at Alemany. White, whose brother Brady is heading into his redshirt sophomore season as a quarterback with Arizona State, is reunited with his Alemany head coach Dean Herrington, who in his first season with the Saints, led the school to a CIF Division 3-AA state championship in 2016. Last season, White split playing-time with sophomore Ryan Stevens at Chaminade. White completed over 54-percent of his passes for 1,418 yards with ten touchdowns and five interceptions. Expect another solid year from Narbonne, which just missed playing for a second straight state title last year, losing to eventual Division I-AA state champ Cathedral Catholic in state semis. Dual-threat quarterback Jalen Chatman, who has given his verbal to Rutgers, is back. Chatman tossed 52 touchdown passes last year, plus ran for six more. He accounted for 3,926 yards through the air and 622 yards on the ground on just 68 carries. Of all of the aforementioned quarterbacks, only one on the Class of 2018 top recruits has a state championship ring. That’s St. John Bosco’s Re-Al Mitchell, who has given his verbal to Iowa State. Mitchell led the Braves to the CIF Open Division title last year and a No. 2 overall ranking in the High School Football America National Top 50. SJB finished No. in our Southern California and California Top 25‘s, which are created with our proprietary algorithm. Mitchell, who got better-and-better as the season wore on, finished with 2,932 yards passing and 1,058 rushing. He completed over 67-percent of his throws with 30 TDs and ten interceptions. He also rushed for 15 scores. Mitchell’s experience will come-in handy against one of the toughest schedules in the nation that includes eastern road games against St. Thomas Aquinas in Florida and St. John’s College High School in Washington, D.C. Aquinas finished No. 6 in our national rankings last year, while St. John’s was ranked No. 34. 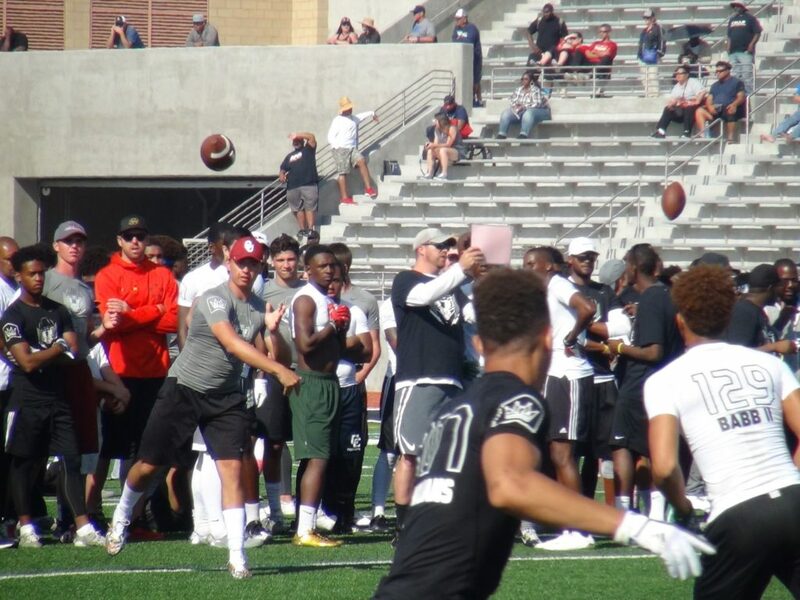 The seventh best signal caller is Steven Comstock from Northview, who just gave his verbal to Fresno State. Comstock, who is also an outstanding wrestler, led Northview to an 11-2 record last year. He passed for 2,679 yards and 30 touchdowns, plus rushed for 830 and 14 scores on the ground. Hart’s JT Shrout has only thrown 36 varsity passes, but he’s No. 8 on the list right now. He’s already said yes to Cal’s scholarship offer. Edison and quarterback Griffin O’Connor just missed playing for a state title last year by one game. O’Connor, who’s given his verbal to UNLV, threw for 3,600 yards last year with 37 touchdowns and only six picks. He also ran for ten TDs with 415 yards rushing. Rounding-out the Top 10 of Class of 2018 college prospects at quarterback is JSerra’s Matthew Robinson, who has given his verbal to Montana. Robinson threw for 2,058 yards and 20 TDs. He was second on the team in rushing with 459 yards and five scores. While that’s an impressive group, the best of the bunch may be Class of 2019 QB J.T. Daniels of Mater Dei. Daniels, who is one of ten offensive starters returning for the Monarchs, who were ranked No. 14 in the nation last year, has thrown for 100 touchdowns in his first two seasons of varsity competition. Daniels is currently ranked as the No. 2 overall recruit in the 247Sports’ composite rankings. In his first two varsity seasons, Daniels has completed 489-of-736 passes (66.4%) for 7,891 yards. Amazingly, he’s only thrown ten interceptions in those 736 attempts. Daniels currently has 18 offers and that number will only continue to go up over his next two seasons. Like Daniels, Hank Bachmeier of Murrieta Valley has started since he was a freshman. In his first two seasons, Bachmeier has completed over 71-percent of his passes. Last season, Bachmeier, from the Class of 2019, tossed 46 touchdowns in 2016 with only three interceptions. He was 234-for-311 (75.2%) for 3,862 yards. For his career, Bachmeier has thrown 82 touchdowns against only 11 interceptions. A kid to keep your eye on for the Class of 2020 right is Venice’s Luca Diamont. As a freshman last year, Diamont threw for 2,066 yards with 21 touchdowns. Luca’s brother played quarterback at the University of Indiana.